This page is dedicated to learning and the sharing of knowledge. It is where we will post vignettes, quotes, historical facts, musings, and images of interest. The aim is to reflect on Food, Culture and Society, on Cuisine as Alchemy, Cuisine as Art; and how food and culinary tradition shapes and is shaped by everyday life and practice: on culture. Note: all posts will be referenced and/or web links included. The author's mask, hand-made according to an ancient Venetian tradition, is a unique piece from Atelier Lago, San Marco, Venezia. A gift from good friends, the mask is a unique imagining of nature and well suited to represent our exploration of the history and traditions of food cultures. The mask will indicate posts of an anthropological perspective. As for the rest we will see where our journey and research take us. Tim Ingold distinguishes between globes and spheres as an alternative way in which to consider the local and global perspectives of the environment in the globalised context. He signals an inconsistency in the two perspectives where the global is ‘afforded to a being outside the world, is seen to be both real and total’ and the local ‘afforded to beings-in-the-world (that is ordinary people) is regarded as illusory and incomplete’ (Ingold, 2000, p.211). A sphere is considered a world that is inhabited or dwelt-in, as opposed to a globe or world that is merely occupied. Different centres will, of course, afford different views, so that while there is only one global perspective, indifferent to place and context, the number of possible local perspectives is potentially infinite (Ingold, 2000, p. 216). Respecting and supporting all forms of human creativity and practice is vitally important. [Ingold, Tim.2000 “Globes and spheres: The topology of environmentalism”, in T. Ingold (ed), The Perception of the Environment – Essays in Livelihood, Dwelling and Skill, pp. 209-218. Jim Denevan, chef and renowned land artist 'is to re-connect diners to the land and the origins of their food and to honour the local farmers and food artisans who cultivate it'. Dinner is always served 'between the soil and the sky', close to the source and next to the 'person who planted the beans, raised the lamb and shaped the cheese on your plate'. 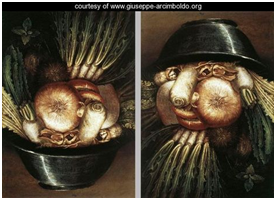 Giuseppe Arcimboldo (also spelled Arcimboldi) (1527 – July 11, 1593) was an Italian painter best known for creating imaginative portrait heads made entirely of such objects as fruits, vegetables, flowers, fish, and books — that is, he painted representations of these objects on the canvas arranged in such a way that the whole collection of objects formed a recognizable likeness of the portrait subject.